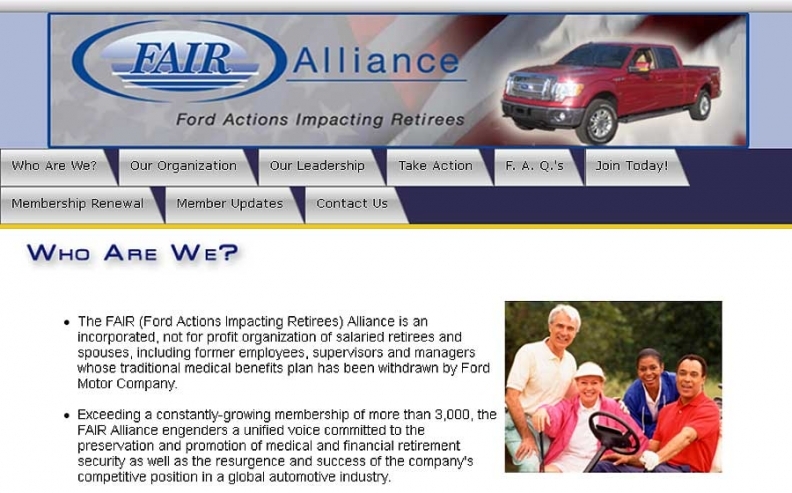 The Ford Actions Impacting Retirees Alliance has more than 3,000 members, according to its Web site. DETROIT -- A group of Ford Motor Co. retirees is calling for rejection of the automaker’s offer of a lump-sum payment instead of monthly pension checks, The Detroit News reported today. The Ford Actions Impacting Retirees Alliance hired a team of lawyers, consultants and accountants to review the proposal Ford made this month, and in a letter to its members, advised against accepting the buyout, the newspaper reported. By the end of the summer, Ford will offer between 12,000 and 15,000 of its white-collar retirees in the United States the option to receive a one-time payment instead of their monthly pension checks. There are about 98,000 white-collar Ford retirees. Retirees are not required to accept the lump-sum payment, and Don Whitehouse, president of FAIR, which is headquartered in Madisonville, Ky., told the News that the letter to the organization’s members says that the pension system is the most fair choice for the retirees. “There is no possible way that we can receive better returns on investments with the existing stock market, CDs or any other financial choices without taking a loss and Ford Motor Co. knows that very well,” the letter read, according to the News. FAIR didn’t immediately respond to an interview request. The organization has more than 3,000 members, according to its Web site. The automaker has $15.4 billion in unfunded pension liabilities that it hopes to reduce through the buyout offer. While the plan may make sense for Ford, Whitehouse told the News that only one retiree has told him that he planned to accept the lump-sum offer.